Thank you NASSCOM and all the delegates! 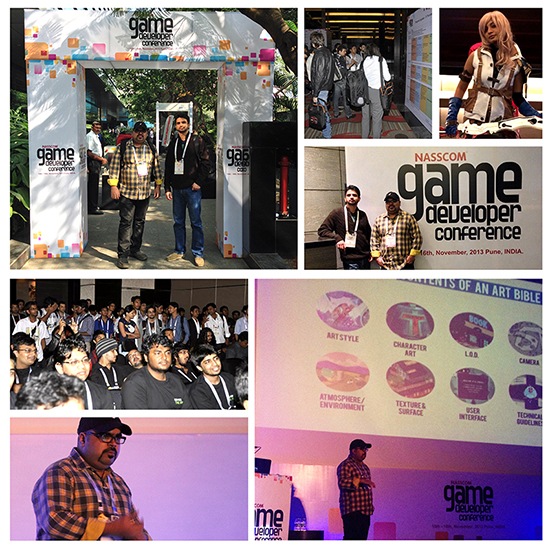 We had a wonderful experience at India’s flagship game developers conference and felt like the torch bearers for Game Art at the event. The venue (a new and bigger one this year) was thriving with an assortment of cosplay, BYOG, talented developers, reputed publishers, and international speakers. Some of the biggest names at the two-day event included Square Enix CEO Yoichi Wada, Unity 3D evangelist Brett Bibby, Channing Hancock Christensen from Facebook, Paolo Pedercini of Moleindustria and Gordon from Simogo Games. Although there were quite a few sessions that invoked interest, we just loved the talk titled ‘Journey of Simogo’ by Gordon as he took us through the making of games with an awesome look and feel such as Kosmo Spin, Bumpy Road, Year Walk, Beat Sneak Bandit and Device 6. In another thought-provoking talk, Paolo Pedercini threw some light over his experiments towards spreading awareness for being ethical and responsible while making games. And to make us very proud, Supersike Games did a post-mortem session of their award-winning ‘Yet Another Bird Game’. Pencillati has done the art for this game. Overall it was a lot of learning, networking, and fun among a crowd of over one thousand odd participants. Our talk titled ‘Game Art Bible: The secret sauce of making great Game Art’ delivered by our Creative Head, Kshiraj was received very well by a packed house of more than two hundred attendees. It was a unique gift that Kshiraj had brought to the event as it was the ONLY Game Art focussed session and packed a lot of information in a short duration. For those who could not attend it, we have made it available for your viewing (and learning) pleasure here. We even offered a free Game Art Bible template and on the spot Game Art evaluation. You can still make use of this offer by getting in touch with us (although subject to the availability of time now). In all, NGDC is a great platform to be a part of and we look forward to being part of it and contribute to it for many more years to come.